Middlegame, no doubt, is the KEY part of chess because the majority of the games are won or lost on this territory. Perfecting your middlegame would definitely lead to much better RESULTS regardless of the level you’re on. Sure you can read tons of books or watch dozens of videos followed by playing zillions of practice games, losing a bunch in the process… That would take you months if not years to complete. And …would that actually give you the results you’re after? First of all, this course isn’t like any other Middlegame course you’ve seen. There is no fuss or filler – just battle-tested techniques that are WORKING on the very top level. 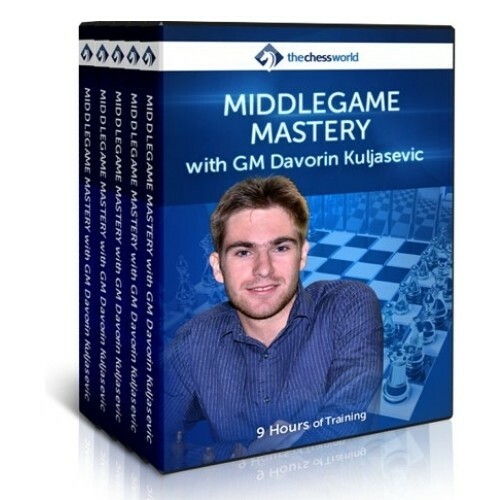 Instead of focusing on the regular things like “opposite side castling” and “outposts” GM Kuljasevic explains the middlegames through the prism of central pawn structures. It helps immensely to have a solid knowledge of typical central pawn structures to successfully navigate through complex opening and middlegame positions. Saving Time and Energy – knowing the typical ideas and pitfalls in central pawn structures saves precious time during the game as some moves can be made on autopilot. It also allows you saving some of your concentration and “brain power”.